For centuries, Iceland was an oppressed colony. Among other things this oppression took the form of a trade monopoly, in which the Icelanders, by law, were only permitted to trade with Danes – our colonial overlords. All merchants in Iceland were Danish, or Danish proxies, and the merchandise they profferred in return for Icelandic wares could be at any damn price and of any damn quality that they pleased. Predictably, the former was usually high, and the latter low. It was common knowledge, for example, that the flour that was sent to Iceland was often mouldy and/or infested with maggots. And it was costly. That was why the Icelanders learned to make breads and cakes with as little flour as possible. The Icelandic flatkökur – a flat bread cooked on a skillet – was made with rye flour that frequently had Iceland moss mixed in, to make the flour go a little further. Today you can still buy flatkökur with Iceland moss in the supermarket – though this not because flour is still outrageously expensive, but because this small strategy for survival has become a part of our daily lives. The same goes for the much-loved pönnukökur – Icelandic pancakes, which are akin to French crêpes (as opposed to North American pancakes). 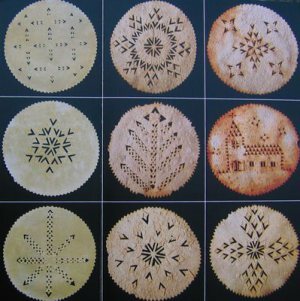 They, too, required a minimal amount of flour, as did laufabrauð – “leaf bread” – a wafer-thin crispy bread that is decorated with cut-out designs before being deep fried. The pretty cut-outs were meant to distract from the fact that the bread was not very substantial in nutritional terms. These days laufabrauð is usually only eaten at Christmas with smoked lamb, but as such it is an absolutely essential part of the yuletide celebrations. Many families also make their own for Christmas, using this as an opportunity to get together and spend some quality time during the Advent. To keep up with Icelandic current affairs, join us on Facebook. For more on the Icelanders in the old days, check out the Little Book.